A week spent in the Mazda2 was much too much fun. Reminiscent of the infamous Miata MX5, the Mazda2, although not anything outstanding, is a fun, pleasant hatchback, with enough amenities to be comfortable, good on fuel economy and fun. Our test car was the Mazda2 Touring hatchback, one of two versions available; the other a Sport, 4-door hatchback. 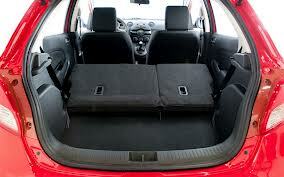 The Mazda2 has a little cargo space to enable drivers to tote some stuff, the rear seat folding down to accommodate loads. This compact 4-door is surprisingly quiet when on the road, is extremely nimble and kicks into gear when it needs to. Re-styled in 2011, this year’s styling is new and eye-catching. 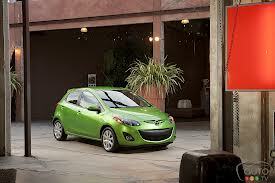 Not outstanding in many ways, the new Mazda2 sports a soft wedge shape, bold and sporty with sculpted sides. Add to that its body-colored door handles, a slanted back windshield, sloped hatch and jaunty little spoiler on the Touring model give it a sporty appearance. The Mazda2’s grille seems to almost beÂ grinning as it shows off its attractive hood and fenders. Good fuel economy, acceleration and responsive handling was a priority at Mazda, as they focused on keeping the little hatchback light. High-strength steel with more welds (and less steel overall), and weld-bonded adhesives in the body was intentional and make this vehicle a lightweight. As the engineers at Mazda searched for places where a few pounds could be salvaged (the wiring harness, door locks and latches, radiator, automatic transmission shifter, pedals, stereo speakers, etc. ), they created a good commuter car. Mazda also focused hard on mechanical details. The seats are comfortable and supportive, and the thick, sporty steering wheel felt good in our hands.Â Although rated a five-seater hatchback, anyone over the age of 25 with long limbs might find the back seat a tad uncomfortable over long distances. A common failing in cars of this category. But that is when you opt to take the luxury, full-size sedan. What we like most about the Mazda2 is that it has that unmistakable fun-to-drive. Mazda quality; the reason their tagline “zoom-zoom” was adopted The little engine is gutsy, and does allow the driver to move the car ahead fast enough in everyday driving situations. Shifting the manual 5-speed is so easy you forget you’re driving manual.Â Responsive brakes and steering, a smooth ride and flat cornering, make the Mazda2 a must-have in our book. Safety equipment on the Mazda2 includes ABS, EBD and brake assist, anti-theft engine immobilizer, tire pressure monitoring system, electronic power assist steering, traction control system, advanced dual front and side impact airbags and curtains, â€œTriple Hâ€ body construction, crushable brake pedal, and collapsible steering column. Options on our test Mazda2 Touring model included an armrest ($170), cargo net ($50), Compass/autodim mirror with HOMELINK($295), and rear bumper guard ($80). This five-passenger hatchback competes with the Chevy Spark, Honda Fit, Toyota Yaris and Hyundai Accent and ranges in price between $14,720-$16,210. Related somehow to the Ford Fiesta, the Mazda2 we drove hovered over $17,000 which seemed like a lot for what is basically a computer car. Although we loved driving the Mazda2, we would rather spend somewhere around $13,000-$15,000. Fuel tank capacity: 11.3 gal. Warranty: 36-mth./36,000-mile bumper-to-bumper; 60-mt./60,000-mile powertrain; 24-hr. roadside assistance. Great if you can live with the impression factor of family vans. Arrive at your favorite charitable trust’s annual black tie gala and be directed to the service entrance. 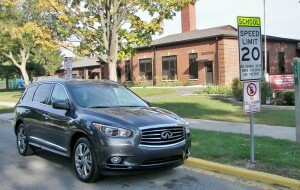 Enter the maxi-minivan’s alter persona, the all-new 2013 Infiniti JX35. Sharing its front-drive / transverse mounted drivetrain platform with the also-new-for-2013 Nissan Pathfinder. The hour-glass front grille, steeply raked headlights, tapering roofline and sculpted doors with chrome highlights all evoke the streamlined Essence concept. Not so much Essence in the D-pillar’s pronounced Hofmeister kink. This entrant to the three-row luxury crossover corral gives up little to the maxi-minivan. It still seats seven. A 4″-inch reduction in wheel-base makes for a more manageable turning radius. Two+three+two seating array, with 41″-inches of legroom in Row-2, makes the JX35 better acclimated to toting around 5 adults in comfort.Â For adults that can bear 31″-inches of Row-3 leg-room egress is a cinch. The split second row seat cushions cleverly fold up to the seat backs, auditorium style, sliding forwardÂ for a path wide enough to accommodate a wide-body. That shorter wheelbase is noticed is in the cargo hold. With Row-3 seats upright, the JX35’s 16-cubic-feet is but half that in the Nissan Quest. All-wheel drive in the JX35 makes amends by pulingÂ 5000-pounds worth of trailer. That the JX35 accelerates about as sprightly as the Quest, somewhere between slouch and supersonic, is no shocker. It receives a mildly massaged VQ 3.5-Liter twin-cam V6 gas engine, tuned for 5 more horsepower at 265 and 248lb-feet of twist. The CV transmission sends power to the front wheels through a slightly shorter 5.17 equivalent ratio. Give it a round of applause for doing a good imitation of a snappy shifting slush-box without straining the engine. A JX35 fitted with $1400 optionalÂ e-differential all-wheel drive is actually 140 lbs-lither than a front-drive Quest LE with dual second-row powered sliding doors. In a hurry to make the rounds? 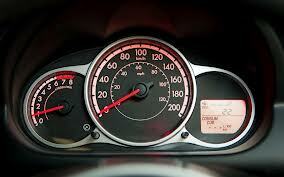 Skip gas-pedal resistant Eco-mode and 60 mph will appear at just under 8 seconds. An easy 20 mpg are returned in combined driving. A cabin moved further behind the front wheels in the JX35 has improved front/ rear weight distribution to 55/45%. The front Mac-strut / rear multi-link suspension employs 1.5mm thicker anti-roll bars to contend with optional Men’s size 18D, smoke-finished 20″-inch wheels wearing 235/55 all-seasons . The JX35 glides along, absent the neurotic bobbing common to SUVs. Jam the brakes or throw it into a fast bend and it will still dive and roll with the best of them. Lumbering in town the e-assist steering rack is largely a limb “fallen asleep, “Â albeit with ith positive on-center weighting. We have never met an Infiniti product which did not brake with gusto. Count the JX35 in. DCA – Distance Control Assist -Â low-speed intelligent cruise control, handy in bumper-to-bumper traffic, which maintains an equi-distance with moving traffic. The JX35 stops in suit with that forward traffic. An audible Forward Collision Warning signals the JX35 driver to apply the brake firmly else it perceives a desire to plow into what lies ahead. LDP – Lane Departure Prevention – interrupts inadvertent lane drift [without signaling] at speeds over 45 mph, viaÂ a laser fired at embedded road reflectors. Power is cut to the opposite steered wheels. Dirty or snow covered roads being the limiting factor. BCI – Backup Collision Intervention – Sonar senses vehicular and pedestrian movement into the rear-wards path of the JX35 while backing. Brakes are applied to prevent a collision. Guess who volunteered to test the effectiveness? Not a totally absent-minded driver?Â Don’t take very many cross-country road trips with passengers who require dual 7″-inch screen video entertainment from dual sources, heated seats and a panoramic moon-roof? Forgo the Technology and Deluxe Touring packages, which inescapably bundle those frills. Pocket the $6 grand. Continue to be impressed by the high contrast electro-luminescent instrument cluster and touch 8″-inch LCD center display. Gander at the nigh shiny real wood veneers and matte metallic trim, convincing as any. Living up to Infiniti tradition front seats in the JX35 are generous in comfort and support. Quilted leather seat inserts, a glove-soft wrapped power adjusting steering wheel, and brushed aluminum door latches are an ode to fashion-istas/ -istos. There is hardly a place where soft materials aren’t fitted. Less friendly to fresh manicures are the busy array of climate system buttons and and a rotary display scroller off yonder. Brilliantly crystalline though those seat-heater dials are, fussing with heating/coolingÂ intensities is a good way to set off LDP. The 2013 Infiniti JX35 comes to market to challenge the standard bearer for luxury three-row crossovers: the Acura MDX. Starting at $41,250, (or the point of a loaded front-drive Ford Explorer), it does so with a $2000 lower price, as Acura offers no front-drive model. Add every option and the price swells to $55,000 as in the case of our loaded all-wheel-drive tester. Coinciding with the launch of a re-designed 2014 MDX, next year’s JX gets “Q – ified” in name along with the rest of the Infiniti line. No official word, yet, from Infiniti on whether JX35 owners will qualify for QX60 plaques. 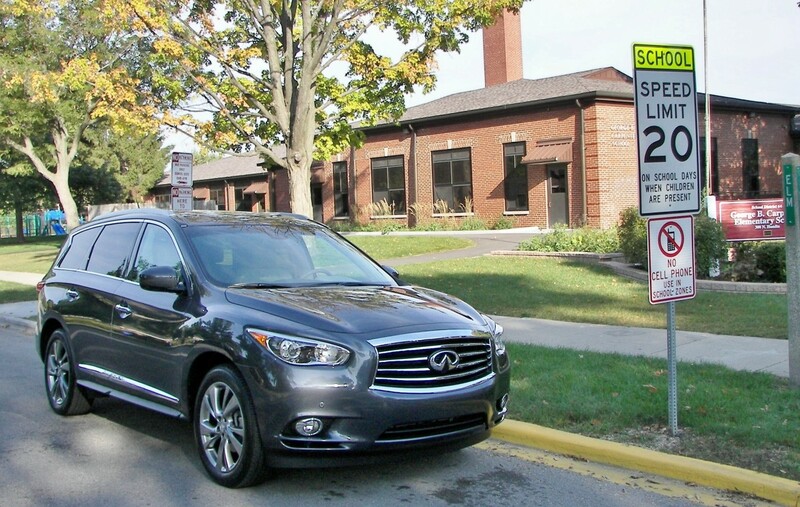 The 2013 Infiniti JX35 in the “Zone.” Look for this full-size luxury cross-over utility vehicle, with seating for seven, in more and more School Zones. The base price of $41, 250 for the front-wheel drive model is still below that of some fully kitted premium maxi-vans. All-wheel drive adds $1400. Key options being lumped into packages as they are these days, our fully decked-out Diamnond Slate AWD tester had a tag with $55,000 written on it. The is the first year of Cadillac’s all-new XTS luxury sedan competing with such favorites as the BMW 528, Lexus GS 350 and Mercedes-Benz E-Class. Other competitors include the Hyundai Equus, a very nice but underrated sedan, Acura RL and Audi A6. Quite the competition, but Cadillac will pull it off. The XTS is a beautifully executed sedan, with a list of amenities a mile long. Just sitting inside the cockpit, in the presence of the XTS’ dashboard and IP is a treat. As with most ofÂ GM’s vehicles, the XTS is available in several iterations: Luxury 4-door, FWD, and AWD, Premium 4-door FWD and AWD, and a Platinum version in both FWD and AWD. One can also opt for a Base 4-door FWD XTS to get into the family. And for livery drivers, Cadillac even offers a W20 Livery Package with front-wheel-drive. Pricing starts at $40,075 and runs upwards of $60,385. Our test XTS sedan topped out at $61,305, without additional options, yet plenty of standard features on this top-of-the-line Platinum collection version. The XTS 5-passenger luxury sedan offers most every feature one could want in a vehicle in this category, including the debut of some of Cadillac’s most technologically advanced features, such as the CUE system (Cadillac User Experience). The XTS is the first Cadillac to offer the new CUE system, a comprehensive and intuitive system for information and media data control. CUE is capable of most high-tech maneuvers today, including Bluetooth operation, placing a call or selecting a song on c ommand wih CUE’s Natural Voice Recognition, and accessing all contacts and wirelessly stream music. The Cadillac XTS’ interior is a sight to behold with its attractive andÂ updated dashboard and instrument panel (IP). The ability of the ambient lighting to produce a very inviting cockpit makes this vehicle very luxurious and cozy. Cadillac’s 12.3-inch color screen allows for lighting and information to be displayed so most, if not all drivers can see it without squinting. Seating is more than comfortable and accommodating, with plush full leather and power driver/passenger seating with 4-way lumbar support. 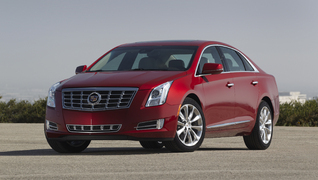 All seats are heated and the XTS sports 10 airbags for over and above safety requirements. The uplevel wood trim in the XTS’ interior will creat deja vu for baby boomers, as it takes you back to the days of large, pillowy-riding GMÂ sedans of the past. Cadillac has surely positioned itself right smack in the middle of the luxury sedan category, where it’s always been but lost favor in years past. As difficult as it may be to compete with and keep up with all the great vehicles offered in today’s marketplace, Cadillac seems to be drawing in more eager consumers. We can see why. Engine: 3.6-liter, SIDI DOHC V-6 VVT, 304 hp. EPA Fuel Economy: 17/28 mpg. Buyer beware when hunting up a used vehicle. Flooded vehicles have hit the market after Storm Sandy on the east coast, making buying a used car a delicate purchase. These vehicles have the risk of finding their way to unscrupulous dealerships, selling to uninformed consumers. Posing financial-and health-risks, cars that have been submerged in saltwater and contaminated by bacteria and various toxins, have been appearing all over the country. When looking at a used vehicle, be sure to check for premature rust, a musty or “perfumed” odor. Be sure to look at the car’s history to determine if the car was registered in a flood-damaged area. Go to www.vehiclehistory.gov before you make a purchase. Insurers, junkyards and auctions are required to report total-loss vehicles to this database within 30 days. Should you decide to purchase a flooded vehicle, know that you may experience corrosion or malfunctions in the electrical systems. Used car prices could increase because of super storm Sandy. Estimates of up to 250,000 vehicles were flooded on the East Coast resulting in higher prices. These price increases will be felt the most on the East Coast, of course, but due to increasingly digital and national market, could be widely felt.